The Pure Mix X7 is an in-line under sink solution to filtered water, with easy to change cartridges so you can keep drinking filtered water without a hitch. It has 4 levels of filtration to remove sediment, rust, and dirt down to 1 micron, ensuring all bad tastes aren’t present in your water, for that healthier cleaner finish. The Puretec PureMix X7 quick-change cartridge can be easily replaced – just like changing a light globe. 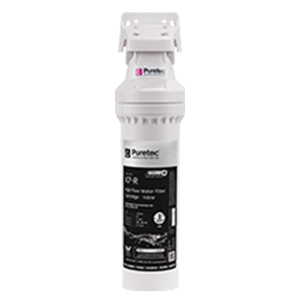 It also incorporates Puretec’s long life filter technology, so you can go longer between filter replacements, and comes with our ^10 Year Platinum Protection Warranty. The PureMix X7 installs under your existing kitchen bench and uses your current tap. This unit can be installed vertically or horizontally, so it won’t clutter up your cupboard.